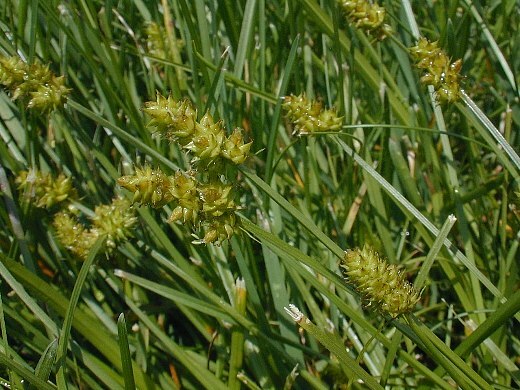 Carex cephalophora plant in bloom. © Fontanelle Forest. FNA. fnaturesearch.org (Accessed 12/2017). Carex cephalophora perennial, stems 30-60 cm long, densely tufted. Flower spikes small, 0.5 cm, in a dense head 1-2 cm wide, basal bracts projecting from the tight cluster, male flowers at top, female flowers greenish to pale tan about 0.3 cm long, 0.1 cm wide, one side flat the other rounded, upper margin toothed, beak sharply 2-toothed, basal scales slightly shorter than perigynium; blooming and fruiting May-July. 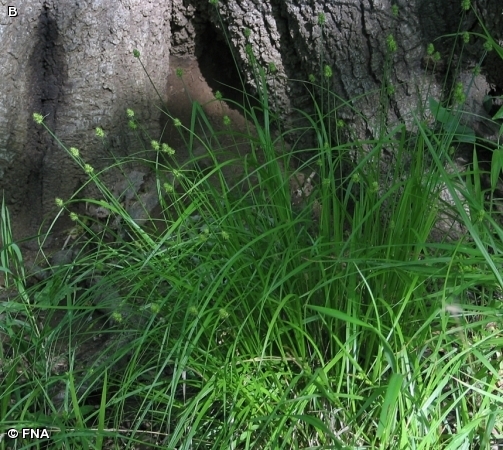 Habitat: Dry woods, soil pH 4.8-7, tolerant of fire, moderately tolerant of drought and shade, intolerant of salt and anaerobic soil (USDA, NRCS 2010).